I’ve been in Toastmasters for two years. If you’re unfamiliar with it, Toastmasters an organization designed to help improve communication and leadership skills. 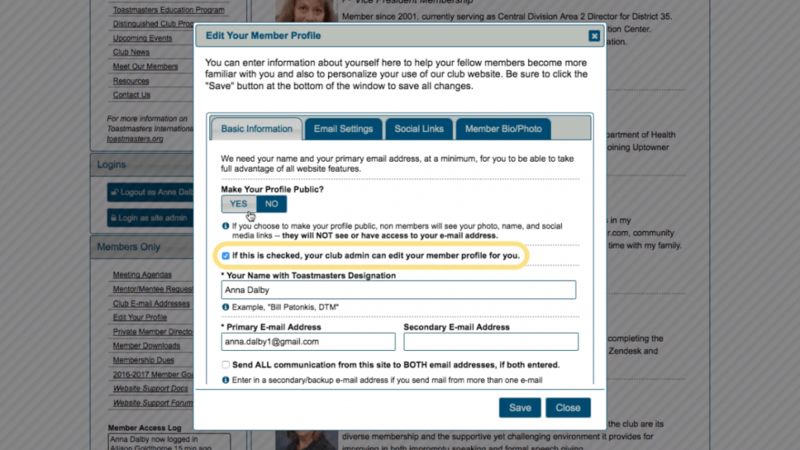 Our club has a website separate from Toastmaster International’s site that allows members to sign up for roles on our agendas, get in touch with other members, etc. When I first joined, the website was very much underutilized. Many members would contact our Vice President of Education to have him/her add them to roles on the agenda. This also meant that some members couldn’t plan out farther than the next meeting because they couldn’t view those agendas. We wanted to solve two problems. First, we wanted to show existing members how to use the website to perform various tasks that they hadn’t been doing in the past. Second, we wanted to provide an onboarding experience to brand new members that had no frame of reference. Our members vary quite a bit in age and technical ability. I wanted to create a solution that’s easy to navigate and reference later as needed. I started by defining the tasks that would be required and listing them in order of operation. My first instinct was to create a series of microlearning videos. However, I decided that one longer video would be more appropriate to the audience since it could be easily bookmarked. After I had decided upon the topics, I outlined a narration script with associated actions. I recorded and edited the voiceover using GarageBand. I recorded the on-screen actions in Camtasia, then imported the finished audio files where I edited the whole thing together. Since audio & video were recorded separately, I added in mouse click sounds where appropriate to give it some additional depth. Besides the audio & video, I added in graphics to help denote the beginning of sections to make seeking easier. Additionally, I used Camtasia’s annotations to call attention to specific areas of the site. When designing these extras and the title screen, I made sure to follow Toastmaster’s brand guides. Once the finished product was exported from Camtasia, I uploaded it to Wistia. I chose Wistia specifically for this project because it has better chaptering functionality than Youtube or Vimeo. With the latter two, you can only add in references to certain times in the video description. Wistia shows the chapters on-screen when the viewer hovers the mouse over the screen and includes dots in the scrub bar to allow for easy seeking. Finally, I was sure to create subtitles in Camtasia and add them to the video in Wistia. Although I think subtitles are useful in almost any video, they were especially relevant for this project. Some members may be hard of hearing or some may be watching the video at their desk with no headphones. Click the video above or see it here. We’ve been using this video for almost a year and it’s helped greatly with website engagement. A link to the video is sent out in our new member welcome email. We see that new members sign up for roles and start giving speeches more quickly than they used to in the past. Our existing members have also started using our website more, which has cut down on the amount of administrative work our VP-Education has to do.